On September 21, 2013 , the Feast of the Nativity of the Blessed Virgin Mary , Apostolic Visitator Bishop Dionysius made ​​pastoral visits to the Church community north Italian city Borgomanero by the invitation of Fr. George Ivaniuta. The visit was confined to the third anniversary of the founding of the chaplaincy for the faithful who live in the Italian Diocese Novara . On September 21, 2013 , the Feast of the Nativity of the Blessed Virgin Mary , Apostolic Visitator Bishop Dionysius made ​​pastoral visits to the Church community north Italian city Borgomanero by the invitation of Fr. George Ivaniuta. The visit was confined to the third anniversary of the founding of the chaplaincy for the faithful who live in the Italian Diocese Novara. At 10o’clock in the church of St. John the Baptist , Bishop Dionysius led Episcopal Divine Liturgy. He was assisted by Bishop Fr. Yuri Ivaniuta , Chaplain Community Church in the Diocese of Novara , and Fr. 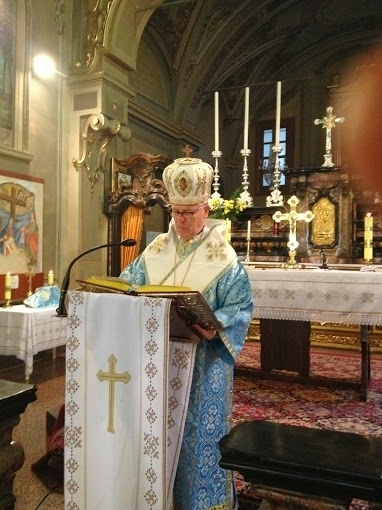 Games Golinskii , Chaplain of the faithful in Torino . In his homil , Bishop Dionysius congratulated the faithful and thanked for the invitation and warm welcome. Then Bishop focused on the theme of the Nativity of the Blessed Virgin Mary : "This is the first feast day in the church year because of the birth of Mary and her" Yes! ", which was said to the archangel Gabriel ,begins the New Testament where God can communicate with humans to the full extent. As sin entered into the world through the first mother Eve, so Grace entered through the Virgin Mary. The first woman was disobedient and let the devil tempt her, the obedience of the second one did not put any obstacles to the Lord for His entrance into this world , saying : "I am the Lord's servant ! Let there be according to Your word ". She became the New Testament tabernacle and in her womb God was able to unite with man forever in the person of Jesus Christ. So God’s and human nature united forever in Jesus Christ, who came into this world to restore what man lost through his sin. And we enter this new story with God as well . God invites each of us to accept the fact that he brought from God the Father. Namely, a new commandment of love. He loved us with everlasting love, " understated himself and became a man ," as we have just heard it from a reading of the Apostle Paul to the Philippians. God can not but love us , though sometimes our lifeis sinful . That is we, who does not love us, because we do not accept God's love but accept hatred, malice , anger , impurity . God can not but love , but we can choose another way of life - hate , that is why there is a real danger of losing that Jesus Christ brought, for only love can save a man move us to another life. Everything else disappears. And our money and all that we have acquired. Church liturgical prescriptions for Marian feasts says us to read the Gospel about Mary and Martha . Surely youshould work to earn for our living , for the " daily bread ", for training children, for caring about different things, as Martha did, but ultimately we have to give everything ,we will not take anything to another world. Another woman, Mary, teaches us that we must be at the feet of the Lord and listen to what the Lord wants us to do . And it is the best part that is not taken away from us. " It should be noted that before the Liturgy Social Policy Adviser of the local municipality Mariola Bourne (MariolaBorgna) visited the temple to greet the Apostolic Vizyatora , pastors and faithful). After the Liturgy, Bishop Dionysius was congratulated by Fr. Fausto Kosalter (Don Fausto Cossalter), Vicar General of Diocese Novara , Italian and local parish priest , Fr. Pier Cheruti (DonPiereCerutti). At the end of the event a festive concert of Ukrainian artists: humourist Nikolay Savchuk and pop singer, People's Artist of Ukraine Bohdan Stashkiva .